“From a sales/retail background, I studied teaching because I wanted to commit to a career that has a positive influence on my community and world. “I think teaching is a unique vocation because it puts you in a position to directly enhance the future of society through the teaching and learning that you engage in with your students. Furthermore, I want to raise and optimise the prospects of all learners from different walks of life so that every child is able to realise their full potential in everything that they do. “I chose the primary teaching specialisation because I believe that the best opportunity to foster a love of learning within children is during their primary school years. That attitude towards their education will then allow them to succeed in all their endeavours later on. 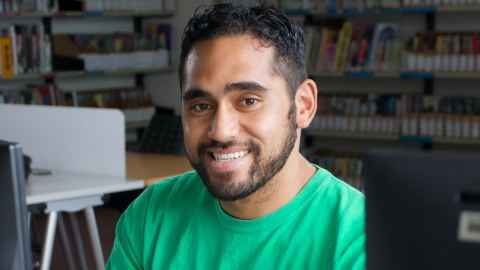 “I would love to establish a teaching career in Dargaville, where I live with my wife and children. Thinking further down the track, I am also considering working with the Ministry of Education, lecturing or training new teachers when I have gained sufficient experience. “The programme has been a very rewarding experience. I have learned from some very good lecturers and have made good friends over the course of my degree. “My favourite part of the primary teaching programme is going out on practicum and working with students in real schools. It’s almost scary the first time, but once you get in there and do some teaching, it’s the most rewarding experience you can imagine. “Everything that you need for your learning is on campus at Tai Tokerau. The staff are very helpful and maintain an open-door policy for whenever we need support of any kind. I remember having difficulty making it to class in my first year because of financial hardship. When the lecturers found out about my situation, they organised petrol vouchers for me and it has made getting to University much easier for me. “I’m having a great ride and I hope many more students get to experience this learning opportunity. I wouldn’t mind seeing some more fellow male teachers come through as well.